Schaumburg Watch MooN One featuring white powder-coated dial with luminescent photo-realistic moon phase, in stainless steel case on leather strap with folding clasp. 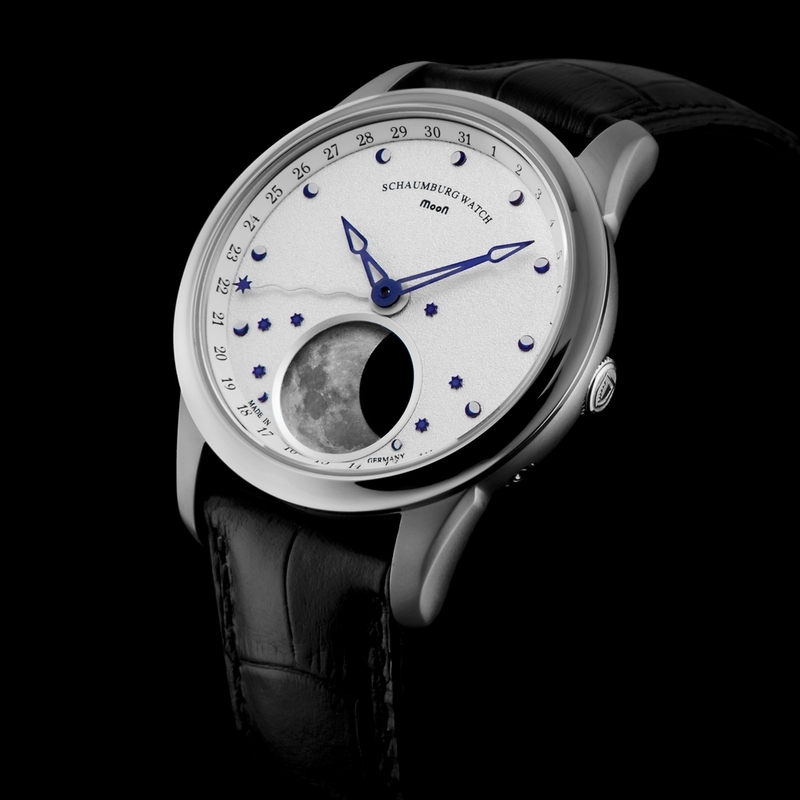 The Schaumburg Watch MooN One features a wonderfully textured sand blasted and white powder-coated brass dial with hand applied crescent moon hour markers and stars surrounding the stunning luminescent photo-realistic moon phase, presented in a matte and polished stainless steel case with transparent exhibition caseback on finest leather strap with folding deployant clasp. Chronolux Fine Watches are delighted to offer as Authorised Dealers and brand new in box, the fabulous Schaumburg Watch MooN One gents automatic watch. 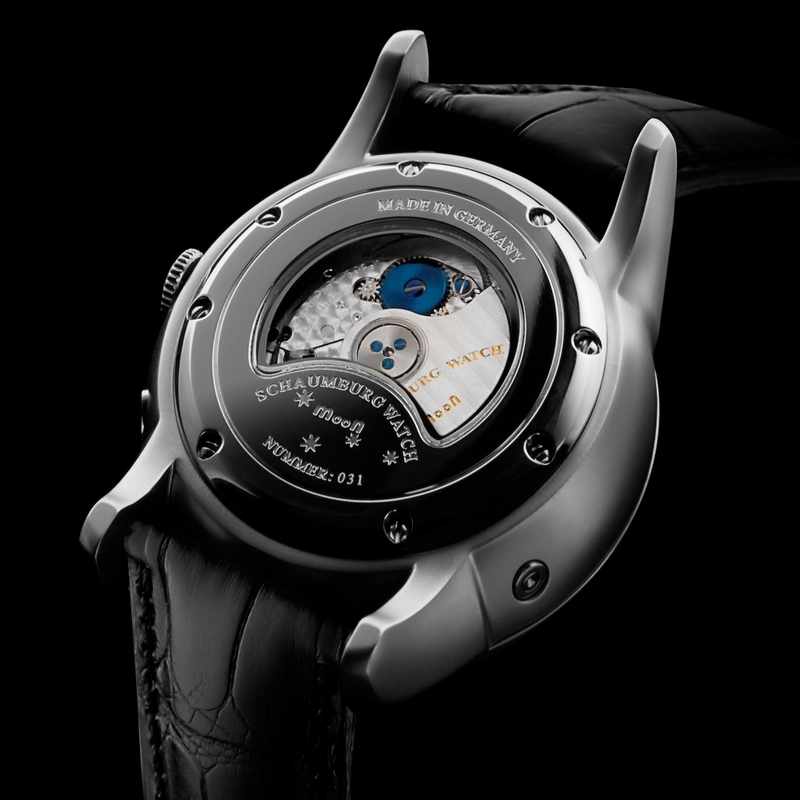 Thanks to the supremely precise chronometer's perpetual moon cycle function, which is adjustable to the minute and accurate to 122.5 years, the Schaumburg Watch Perpetual MooN Collection boast true moon phase precision, beautifully depicted with a semi transparent disc casting the Earth's shadow as it passes across the face of the moon, as opposed to the more commonly-found horological solution where the moon itself rotates in and out of view.